Welcome to the Department of Microbiology, Immunology, and Cancer Biology (MIC)! 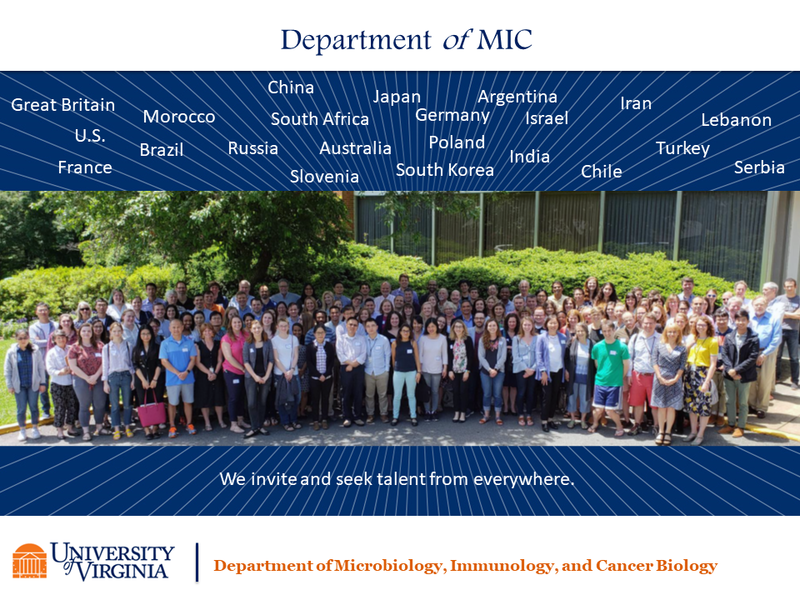 Microbiology, Immunology, and Cancer Biology is the largest basic science Department with the UVa School of Medicine, comprising an outstanding group of faculty, students and post-doctoral fellows conducting cutting-edge research in many exciting areas of basic biology and human disease. Our research investigations take an integrated and cross-disciplinary approach to address questions in three key major fields: Microbiology, Immunology, and Cancer Biology. Our faculty members use a variety of in vitro and in vivo approaches, including all of the modern tools of molecular biology, biochemistry and cell biology as well as mouse models and model organisms. It is notable that the research conducted by our faculty often spans more than one of the above three areas i.e. intentionally cross-disciplinary, to probe and answer scientific questions in a much broader scope. I encourage you to visit the various links to learn more about the faculty within the Department, graduate education opportunities, news, seminars etc. Thanks for visiting the MIC!